Heat oven to 350°F. In medium bowl, stir together cream cheese, garlic powder, jalapeños and corn; set aside. Place broken taco shells in resealable food-storage plastic bag; seal bag. Crush taco shells with rolling pin until coarsely ground. (Or, place broken taco shells in food processor bowl with metal blade; process until coarsely ground.) Pour crumbs into shallow dish; stir in chili powder. Between pieces of plastic wrap or waxed paper, place each chicken breast, smooth side down; gently pound with flat side of meat mallet or rolling pin until about 1/4 inch thick. Spread butter over one side of each chicken breast. 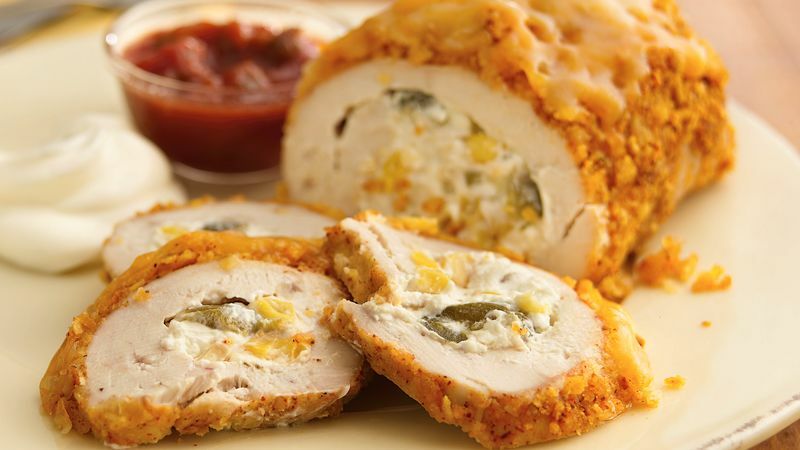 Place about 1/3 cup cream cheese mixture on center of buttered side of each chicken breast; roll up chicken. Pour buttermilk into shallow dish. Dip chicken rolls in buttermilk, then coat with crumb mixture. Insert toothpick to secure. Place in ungreased 8-inch square (2-quart) glass baking dish. Drizzle with honey. Bake 35 to 45 minutes or until chicken is no longer pink in center. Sprinkle with Mexican cheese blend; bake 4 to 5 minutes longer until cheese is melted. Serve with salsa and sour cream.